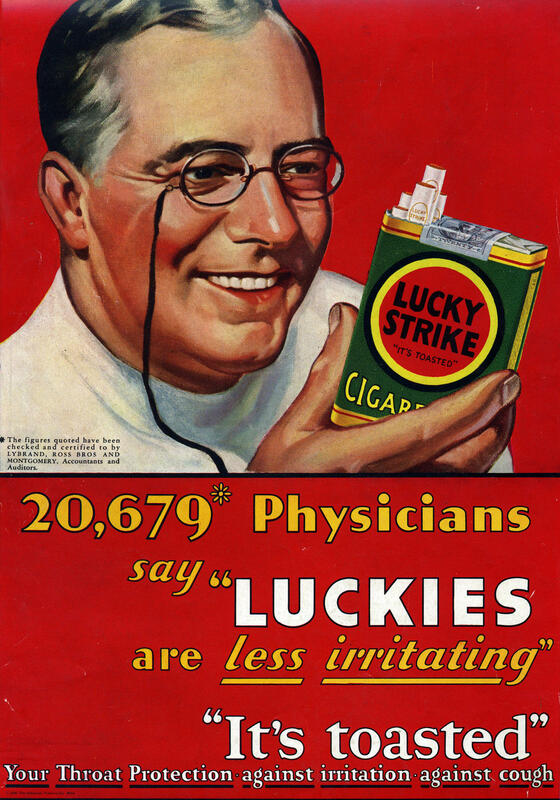 Tobacco companies incorporated doctors in their ads, such as this 1930 Lucky Strike campaign, to convince the public that smoking wasn't harmful. Philip Morris's iconic Marlboro Man from 1962. 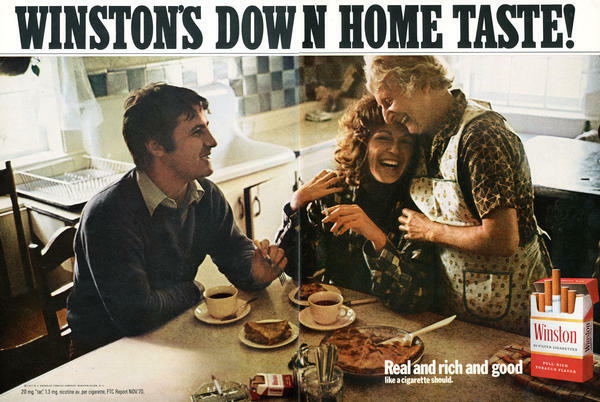 Years after the 1964 surgeon general's report on smoking, tobacco companies continued to downplay the dangers of smoking in their ads, such as this one from Winston in 1970. This U.S. government poster in the 1960s shows smokers what they could afford to buy if they gave up cigarettes. Before the surgeon general's 1964 report, public health rarely concerned itself with hazards beyond infectious disease epidemics. 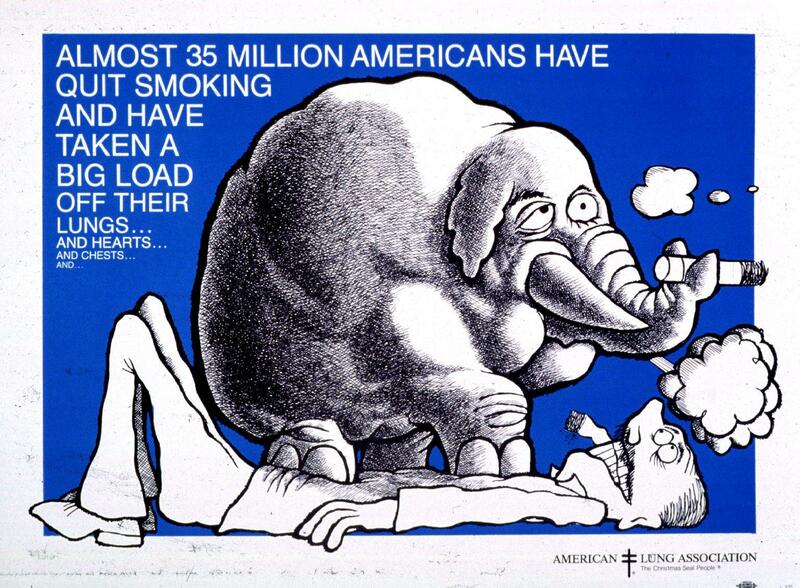 Like an elephant on your chest: a 1983 anti-smoking ad from the American Lung Association. 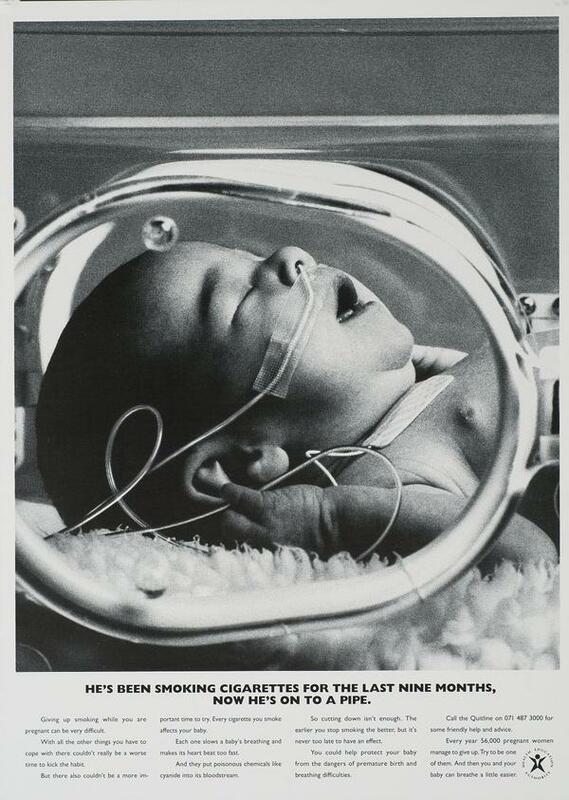 This anti-tobacco campaign from the United Kingdom's Health Education Authority warned about the dangers of smoking while pregnant. More recently, anti-tobacco campaigns have gotten more graphic about the negative consequences of smoking, such as this poster from the American Cancer Society's Nasty Effects campaign. Today, 1 in 5 American adults is a smoker. 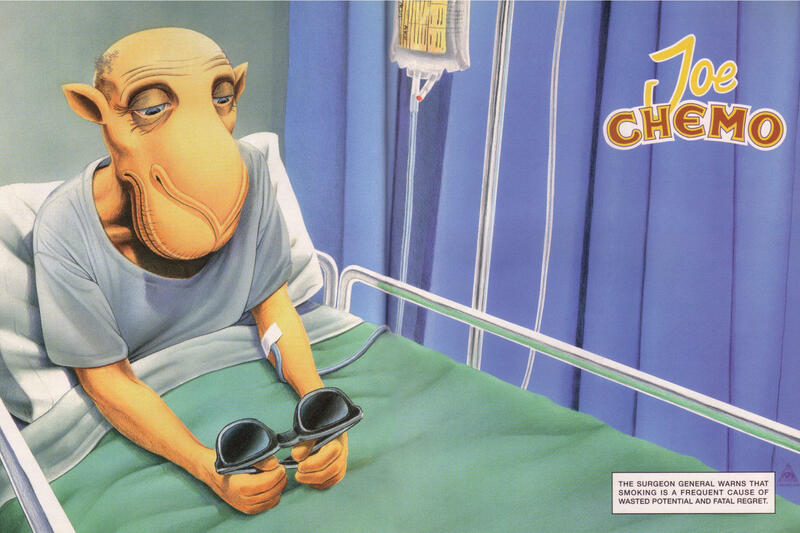 Tobacco company brand ads are among the most spoofed in advertising history, like this "Joe Chemo" ad from 2001. 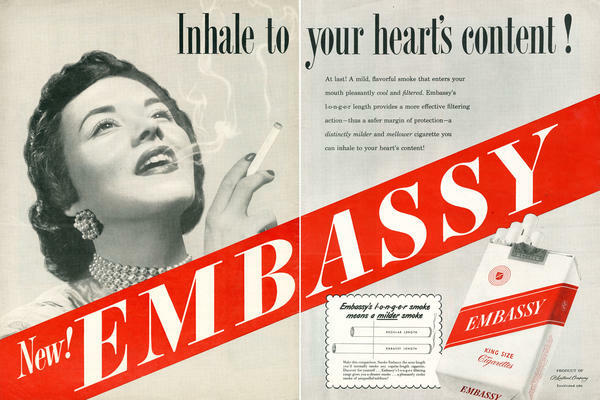 Before the surgeon general's 1964 report, people didn't know about the dangers of smoking, as this 1949 Embassy cigarette ad reveals. An analysis in the JAMA, the American Medical Association journal, estimates that 8 million Americans avoided premature death as a result of tobacco control efforts launched by the 1964 report. Those efforts range from cigarette warning labels to escalating taxes on cigarettes to proliferating restrictions on where people can smoke. They were augmented by a series of high-profile surgeon general reports detailing the dangers to smokers, unborn children and bystanders. But the impact of the 1964 report is even broader than that, according to Harvard historian Allan Brandt. "If we look at the history of public health – from the safety of cars and roads, other dangerous products, the environment, clean air, the workplace – all of these issues really have their origins in a moment 50 years ago around the first surgeon general's report," Brandt tells Shots. He's the author of a 2007 history, The Cigarette Century. But all that impact unfolded over decades, and for many years it didn't appear the report would launch such a revolution. In the 1970s, when Joanne Iuliucci of Staten Island, N.Y., started smoking at age 12, she says she had no idea that smoking was dangerous, even though surgeon general's bombshell report had come out six years earlier. "Absolutely not! Why would I?" says Iuliucci. 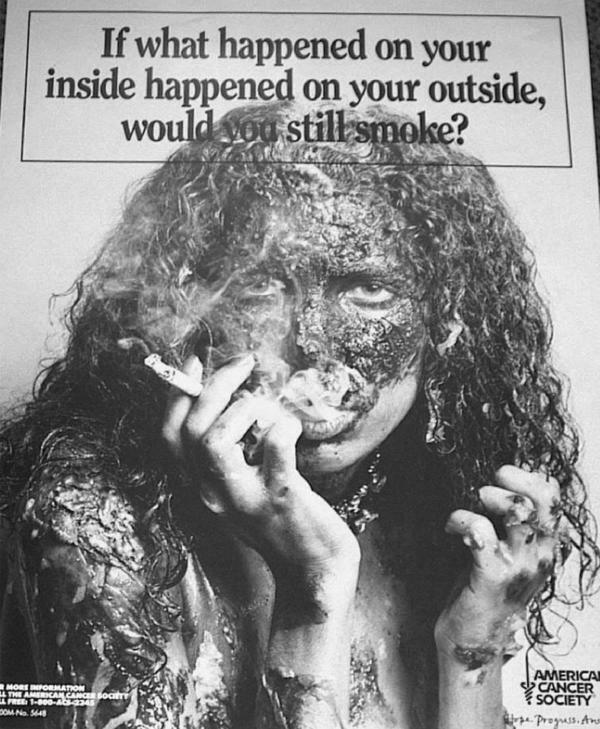 "Because everybody was smoking. Mother and Father were smoking. Doctors were smoking. You were able to smoke in the movie theater, food shopping with Mom. Really, back then nobody knew what we know today." In large part that's because the tobacco industry maintained for years that experts still disagreed about the evidence, Brandt says. "Their campaign – their invented controversy – was actually enormously successful," Brandt says. "If you asked people on the street, 'Do we know whether smoking causes lung cancer or not?' many would say, 'Well, you know, there's a very significant controversy about that.' "
But in fact, by 1964 there was very little controversy among scientists outside the tobacco industry. In the 1950s, highly regarded studies had already made the link between smoking and lung cancer. By the early 1960s, there was mounting concern among public health officials and cancer and heart disease specialists. President John F. Kennedy was not eager to take on the tobacco industry, Brandt says, because Kennedy needed the support of tobacco-state Democrats to further his civil rights agenda. "So Kennedy was not happy about the idea," Brandt says. "But when asked about it publicly in a press conference, it became harder and harder for him to back away. And he punted, really. He said: 'This is what my surgeon general will do.' "
That was Luther Terry – the first surgeon general to get such an assignment. Back then, public health rarely concerned itself with any hazards beyond infectious disease epidemics. And the American Medical Association wasn't keen to have government officials preach on the dangers of smoking. "There were some people in the profession who would say, 'You know, this is really between a patient and his or her doctor,' " Brandt says. Terry also had to worry about tobacco industry opposition. So when he put together the expert panel that wrote the report, he allowed the industry to veto any member without cause. And he carefully balanced the committee – there were five smokers and five nonsmokers among the scientists and physicians, and none had a publicly declared position on the question of smoking and health. One Harvard chemist on the panel was a four-pack-a-day smoker. During the meetings there were ashtrays on the conference table, and smoke filled the room. But the group didn't flinch when it came to declaring that smoking is deadly. "The strongest relationship between cigarette smoking and health is in the field of lung cancer," Surgeon General Terry told the 200 reporters gathered for the release of the report on January 11, 1964. It was held on a Saturday morning to minimize impact on tobacco stock trading, and also to guarantee good play in the Sunday newspapers. "There is a very strong relationship, and probably a causal relationship, between heart disease and cigarette smoking," Terry said. The effect of that declaration has been enormous, according to Theodore Holford of Yale, a principal author of the JAMA analysis published Tuesday. "We estimate that 17.7 million Americans have died since 1964 from smoking-related causes," Holford says. "While that's a large number, an additional 8 million deaths would have occurred had there not been any tobacco control. This amounts to about 157 million years of life – about two decades for each of those lives that were saved as a result of tobacco control efforts." And many of those years of life – 42 million years of human experience – were among Americans who would have died before the age of 65. Holford says tobacco control has increased U.S. life expectancy by 30 percent since 1964, more than any other public health or medical measure. And the benefits in reducing smoking deaths continue into the future. Still, about 1 in 5 American adults is a smoker – more than 43 million people. And each year more than 440,000 people die prematurely in this country from tobacco-related disease. Joanne Iuliucci eventually stopped smoking – after her mother died of lung cancer. "I quit on November 1, 2010," she says, "and a year later, they told me I needed a lung transplant." The transplant, which she got 18 months ago, was necessary because she had end-stage emphysema. And that Harvard chemist on the surgeon general's panel who smoked four packs a day was diagnosed with lung cancer within a year of the 1964 report, and died of the disease. This weekend marks 50 years since the surgeon general, Luther Terry, released his landmark report on smoking. Back in 1964, cigarettes were part of everyday life. Smoke clouded offices, restaurants, planes. 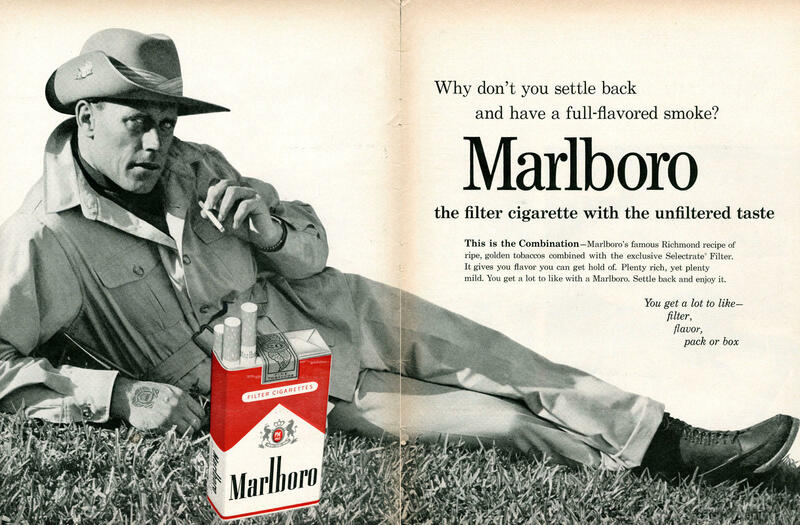 Athletes and film stars advertised cigarettes on television. But Terry's authoritative report changed all that. 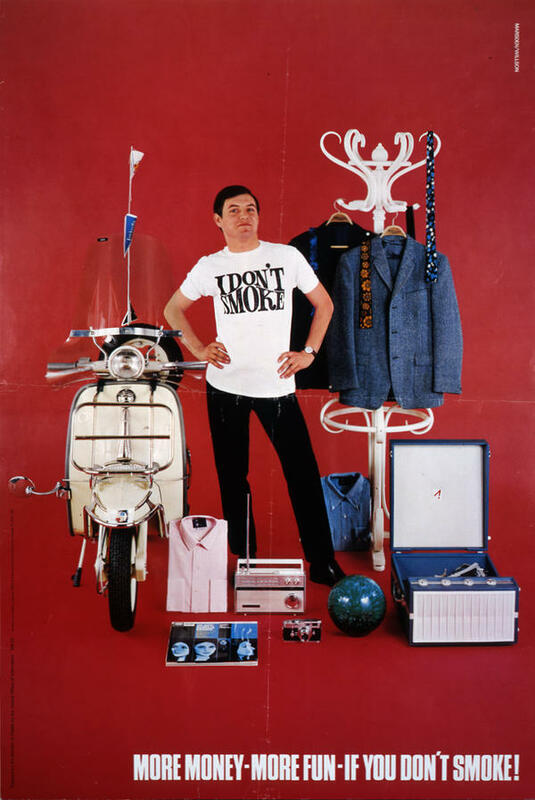 He declared in no uncertain terms that smoking is dangerous. LUTHER TERRY: The strongest relationship between cigarette smoking and health is in the field of lung cancer. SIEGEL: Today, new research suggests that Terry's report may have had an even bigger impact than first thought, as NPR's Richard Knox reports. RICHARD KNOX, BYLINE: Joanne Iuliucci started smoking when she was 12, 44 years ago. The surgeon general's report had come out six years earlier, but she says she had no idea smoking was dangerous. JOANNE IULIUCCI: Absolutely not. Why would I? Because everybody was smoking, mother and father were smoking, doctors were smoking. You were able to smoke in the movie theater, food shopping with my mom. It was really, back then, nobody knew what we know today. KNOX: In large part, that's because the tobacco industry maintained for years that experts still disagreed about the evidence, says Harvard historian Allan Brandt. ALLAN BRANDT: Their campaign, their invented controversy, was actually enormously successful. If you asked people on the street: Do we know whether smoking causes lung cancer or not, many would say, well, you know, there's a very significant controversy about that. KNOX: But in fact, Brandt says by 1964 there was very little controversy among scientists outside the tobacco industry. He says President Kennedy was not eager to take on the industry. Kennedy needed the support of tobacco-state Democrats to further his civil rights agenda. BRANDT: So Kennedy was not happy about the idea of needing to take this on. But when asked about it publicly in a press conference, it became harder and harder for him to back away. And he punted, really and he said: This is what my surgeon-general will do. KNOX: Now, it's important to understand that surgeons general had never been given such an assignment. In fact, public health rarely concerned itself back then with any hazards beyond infectious disease epidemics. 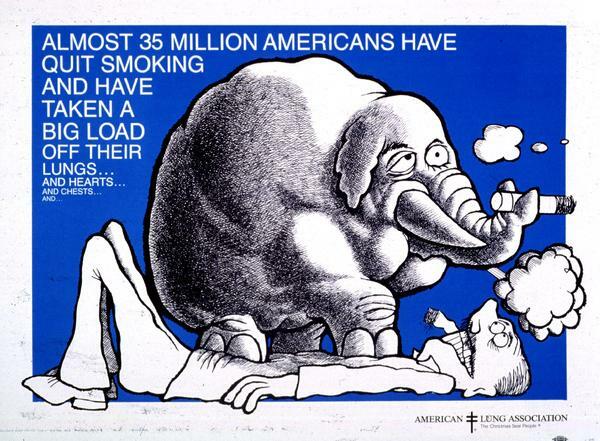 And the American Medical Association wasn't keen on having government experts preach on the dangers of smoking. BRANDT: There were some people in the profession who would say, you know, this is really between a patient and his or her doctor. KNOX: So when Luther Terry put together his expert panel, it was carefully balanced. BRANDT: The committee was made up of 10 scientists and physicians, five of whom were smokers, five of whom were not. KNOX: During the meetings, there were ashtrays on the table and smoke filled the room. One Harvard statistician on the panel was a four-pack-a-day smoker. But the group didn't flinch when it came to declaring that smoking is deadly. And a new analysis, in this weeks' Journal of the American Medical Association, documents the enormous impact of that declaration. Study author Theodore Holford of Yale says eight million Americans would have died if it hadn't been for the tobacco control efforts sparked by the report. THEODORE HOLFORD: So this amounts to 157 million years of life that were saved as a result of the tobacco control effort. KNOX: Much of that 42 million years of human experience was among people under 65. That kind of impact is hard to take in. HOLFORD: It is a very large number, yes. And it's a rather staggering number in a way when we found it. KNOX: Holford says tobacco control has increased U.S. life expectancy by 30 percent since 1964, more than any other public health or medical measure. But Brandt, the Harvard historian, says the impact of the 1964 report is even broader. BRANDT: If we look at the history of public health - from the safety of cars and roads, other dangerous products, the environment, clean air, the workplace - all of these issues really have their origins in a moment 50 years ago around the first surgeon general's reports. KNOX: And the benefits in reducing smoking deaths continue into the future. Joanne Iuliucci, whom we met earlier, eventually stopped smoking after her mother died of lung cancer. IULIUCCI: I quit November 1, 2010. And a year later they told me I needed a lung transplant. KNOX: The lung transplant was necessary because she had end-stage emphysema. By the way, that Harvard statistician on the surgeon general's panel who smoked four packs a day, within a year of the 1964 report he was diagnosed with lung cancer and later died of the disease. Richard Knox, NPR News. Transcript provided by NPR, Copyright NPR.